Amazon is buying Whole Foods in a deal valued at $13.7 billion. 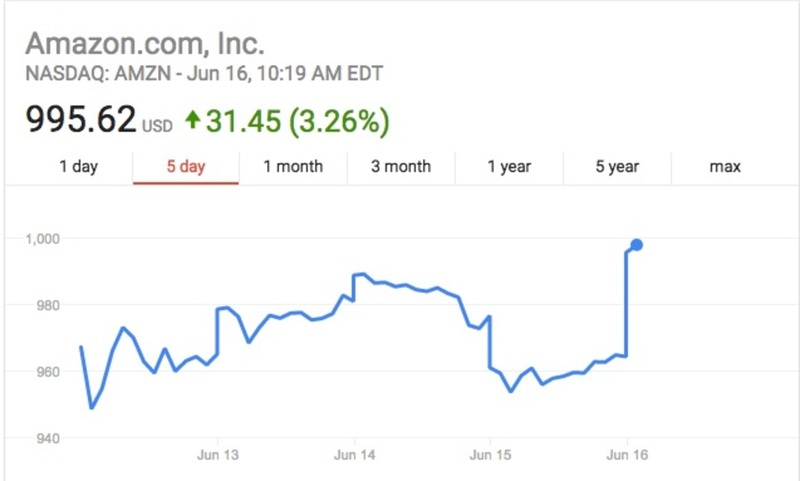 While competitors’ stocks appear to be freaking out, Amazon is unsurprisingly performing very well. The stock is currently up 3%—as of right now the stock price is at almost $996 a share. Last night it closed at a little over $964. Jeff Bezos currently owns 80.9 million Amazon shares. Doing a little back-of-the-napkin math, it appears Bezos’s worth increased by $2.57 billion this morning, likely thanks to the purchase. We’ll see how this plays out over time, of course. Disclosure: Joe Mansueto, owner of Mansueto Ventures, which publishes Fast Company, sits on Whole Foods’ board.